this is an amazing story. A story that shows that India can start eradicating poverty very fast and very cheaply. This is the story of the degradation and the regeneration of Jhabua - a poor tribal district of Madhya Pradesh bordering Gujarat. In 1985, when I first visited the district, I thought I had been catapulted to the moon. The degradation was just extraordinary. In 1986, when Prime Minister Rajiv Gandhi asked me to address his Council of Ministers and subsequently all the 27 Parliamentary Consultative Committees attached to various Union ministries on the state of India's environment, I began all my presentations with the moonscape of Jhabua. "Beware," I used to say. "This is what India is becoming." One minister even said, "Agarwal, you are showing us pralaya (the end of the world in Hindu myths)." Therefore, when Madhya Pradesh Chief Minister Digvijay Singh, whom I have never met, said that he would be happy to release our latest report on the state of India's environment which focuses on traditional water harvesting systems but that he would like to do so in Jhabua, I readily agreed, because it was over a decade since I had been there. When the time came to go, I was quite unwell and stayed back while my colleague, Sunita Narain, took the train. But Digvijay Singh, who was in Delhi, suggested that I take his plane to go to Jhabua. As I could not say no to his kind gesture, I got out of bed after a two-week-long bout of bronchitis and high fever, and went. On the plane were some senior politicians of the Congress party. The discussions revealed a sense of despair about the state of the country. One of them even said, "Just tell me, even if you or I were to become the prime minister, just what is it that we can change?" I, therefore, landed in Jhabua feeling dismal. But the rest of the day made me a new man. After the release of the book in front of over 500 village people involved with watershed development, I returned the plane and decided to visit a few villages before I made my way back by car to Indore that night. What I saw was astounding. Instead of a moonscape, there was a land being nursed and being brought back to life with great love and care. Trees were beginning to grow and there was green grass all around. There was good coordination amongst the district officials. And the villagers had formed village-level committees to take charge of the watershed development work. They proudly talked of the enormous benefit they were already reaping because of the increased availability of grass. I asked the district forest officer, "But just what did you do to allow these poor villagers to take control of the management of government forest lands? What laws and rules did you amend?" He stared back at me blankly. "Why, what is the problem?" he asked. I retorted, "But all over the country forest departments just don't allow villagers access to the management of forest lands. It is the most contentious issue in forest management." He still stared at me blankly as if I was asking a meaningless question, which indeed in many ways it is. I soon understood the reason. The watershed programme in the state is supervised directly by the chief minister (see box: Mission control). Given the political will behind the programme, bureaucratic rigmarole which stifles millions of other innovative efforts, just did not figure in Jhabua. In addition, the chief minister has chosen a bureaucrat who knows the subject to coordinate the programme, unlike hundreds of generalist administrators who don't know or feel anything about anything. On the other hand, R Gopalakrishnan, who was district magistrate of Jhabua in the mid-1980s when the land was reeling under massive and successive droughts, became so interested in land management that he took time off to do a master's on the subject of poverty and environment in usa. In the interim he also took a keen interest in a paper that Sunita and I had written called Towards Green Villages in which we had identified the key lessons of success stories like Sukhomajri in Haryana and Ralegan Siddhi in Maharashtra. Gopal wanted to go ahead and do a PhD on the subject when Digvijay Singh asked him to coordinate this programme. Gopal took to it like a fish to water. The result: there is rapid regeneration because of the combination of water conservation together with afforestation and natural regeneration, at a cost that is unmatched by any afforestation programme and with no new addition of government babus. Jhabua is a dramatic story because of the three key ingredients that are missing in most government programmes: political will, competent and committed bureaucratic support, and people's participation. Every politician in India talks about eradication of poverty. But there is not one, I repeat, not one, who knows what to do. The story of Jhabua shows that a beginning can be made and made quite fast. It is a story that people like Atal Behari Vajpayee, Sitaram Kesari, I K Gujral and a host of others should read like a primer. Whether these lacklustre leaders will do so, I do not know. But Jhabua does show that there is no need for dismay. All that is needed is a sense of challenge. My congratulations to Digvijay Singh and Gopal. After coming back, I sent Down To Earth reporter Richard Mahapatra twice to Jhabua to further investigate its turnaround. I hope his story inspires our readers as it has inspired me. Maybe one day Richard, who comes from Orissa, will do a sequel on why Jhabua is working whereas Kalahandi, with exactly the same kind of ecological and social conditions, is not. the ecological carnage that Jhabua has witnessed in the last five decades is sporadically mentioned in official records. Elder residents, however, remember how the dense forests once enveloped the district. "Hardly 60 years ago, my home was surrounded by dense forests," says 90-year-old Dholji of Samoi village. "The forests belonged to the king and he allowed us to settle in it. At night tigers roamed around my home and my bow and arrows were ever on the ready." Today Dholji's home is surrounded by fields. The forest and the tiger have both faded into the mists of time. From 1963 to 1993 more than 15 per cent of the districts forest and village commons were turned into farmland. By 1993, the dense forest cover shrunk to 4.9 per cent of the geographical area. According to the National Centre for Human Settlement and Environment, Bhopal, the forest working plan for Jhabua in 1964-65 records that the forest cover was 33.3 per cent. Amlia, an 85-year-old resident of Piplipada village, recalls: "Piplipada was inaccessible 50-60 years ago. My family was employed by the king of Jhabua as a guide for shikar (hunt). The forest was thick with sal trees. Suddenly, there was hectic tree felling and I was employed full time for it along with other villagers." Golia, a landless villager of Piplipada, who earlier used to live on felling trees for merchants now protects forest lands for regeneration. "Earlier the forests belonged to the king who never allowed large-scale felling," he says. "We Bhils depend upon the forest for our survival, we never intended to destroy it. Somehow the ownership of the forest changed and the government babus appeared. We saw them helping thekedars (contractors) felling trees. It continued till the forest was given to the gram panchayat (village council)." While forest officials agree that there was uncontrolled felling of trees, they blame it on the rapid increase in population and resulting pressure on land being brought under the plough. But, at that time, some people came and told the villagers that the forests belonged to the tribals and they should encroach on them for agriculture. Villagers started clearing the forests for agriculture and constructed houses in different hamlets. 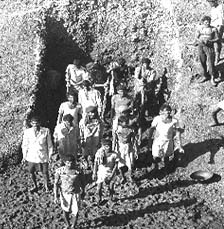 The post-independence socialist movement hawked encroachment of the forest, motivating the Bhils to convert their private forest lands into agricultural lands to strengthen their rights on it. This led to faster deforestation. Deforestation resulted in the cultivation of the uplands and brought in its wake the ecological disaster which resulted in a loss of land productivity. It also meant fewer jobs, less income and migration of labour to towns in search of jobs. Nagu Bhai, a 40-year-old resident of the catchment area of the Hathipawa microshed, and a member of the village forest committee, recalls: "When I was a child the hills were covered by thick forests. They were our only source of livelihood and never failed to sustain us. When the forest vanished, we were orphaned. Only then did we realise that the forest was our god. I had to sell my cattle, as no fodder was available and migrate for months in search of work. But this year I didn't have to migrate, I had surplus fodder and didn't sell my cattle, because I protected the hills." When the Rajiv Gandhi Mission for Watershed Development, ( rgmwd) came to Jhabua on August 20, 1994, it came to a tormented and tortured land. But it came with a healing touch, mending the scars of an ecological ravage. A decentralised and time-bound programme, the rgmwd started with the objective of improving 12 lakh hectares (ha) of land through watershed treatment within four years. Previous watershed management programmes had failed to produce the desired results. Unlike the rgmwd, where all activity was put under one body for coordination, these projects were implemented in segments by different departments. Relief operations were ad hoc in nature and soil and water conservation was never given any importance. Implementing agencies also lacked proper guidelines on watershed design and planning. The people were never consulted. The mission broke all the rules. The people, instead of the bureaucrats, became the decision makers. In 1996 the target of the rgmwd was revised to regreening 28 lakh ha, one per cent of the nation's total land area covering 6,691 villages through 5,024 watersheds. The mission was introduced in 42 of the 45 districts of mp. The mission was started in October 1994 in Jhabua where at present 218 micro-watersheds function, covering 1240 sq km of land - nearly one-fifth of the district. With 12 government agencies and seven non-governmental organisations (ngos) as project implementing agencies, Jhabua has become a model of watershed management. Surprisingly, the mission was the brainchild of a bureaucrat who was to have been taken into the technology mission initiated by Rajiv Gandhi. R Gopalakrishnan was the collector of Jhabua when it was reeling under the worst drought of the century in 1985. Today he coordinates the Rajiv Gandhi Mission (rgm). It was his experience in Jhabua which inspired him to look for a green poverty eradication measure. In a research paper for the Hubert Humphrey Fellowship in Cornell, usa , Gopalakrishnan wrote, "The problem of poverty faced by people living in drought-prone districts is linked to the environmental degradation there... this calls for action which can address the linkage." "Jhabua made me certain that we needed one such system under which not only the problem of poverty could be tackled, but also environmental problems," says Gopalakrishnan. "More so, we needed the system to work under a time frame for result assessment, with the active participation of the people." "In the last 50 years, you just check out, all programmes and schemes meant for people have not included them. When the end-users are not involved, the system simply doesn't work," he says. When Gopalakrishnan returned to India, his study was accepted by Digvijay Singh as the rgm. Later the mission was expanded to cover other sectors like primary education and rural industrialisation. The rgmwd is funded by eight schemes, both central and state-level. There are the Drought Prone Areas Programme (dpap) funds and the Employment Assurance Scheme (eas) at the district level. Intensive Jawahar Rozgar Yojana (jry) funds at the district and panchayat level (see graph: Enhanced target), sectoral funds at the district level and funds from the Integrated Watershed Development Programme (iwdp).  Involving people's representatives and members of Panchayat Raj institutions. Power flows through the hands of the people into the rgmwd administrative set-up. The monitoring is done at the highest level but bureaucratic meddling is out. Even the political machinery has been short-circuited. In truth, the chief minister is directly linked to the project as the mission-level apex body, the Empowerment Committee is chaired by the state chief secretary who reports directly to the chief minister. Policy matters are aired and thrashed out at this level in the presence of the secretaries of rural development, forests, Panchayat Raj and other members. These decisions are passed on to the state-level mission office which looks after the administrative jobs. The office is headed by a mission director who is assisted by an advisor and other subordinates. The mission director reports to the rgm coordinator. The office works as the fountainhead for the activities of the other agencies involved in the watershed activities. The planning implementation agencies form a watershed committee for every micro-watershed of 500 to 1,000 ha. Elected by the gram panchayat, this panel comprises eight to 10 members, one-third of whom are women and another third are from the gram panchayat. In some cases the panchayat sarpanch (village leader) is the head of the panel. In Jhabua, this trend of giving more representation to the panchayat members is more visible. The watershed committee decides which trees are to be planted. It imparts information on where and how to build check dams, ponds and other structures. Decisions relating to all gulley plugs, contour bunds and boulder checks are shouldered by local initiative. The committee's kitty is replenished from time to time by the planning implementation agencies and the role of the bureaucrat is reduced to giving guidelines on how to spend the money. Around 10 per cent of the money given to the panel goes into a fund for maintenance. Also, whatever the panel receives as donations and saves on labour through the help of unpaid volunteers is added to a development fund. Here villagers get a chance to function like bureaucrats, using this money for various welfare schemes in the village. Other community structures which existed before the coming of the project are known as user groups and self help groups. The latter consists of a body of landowners who will directly benefit from watershed management from the user group, which undertakes activities in both government and private lands. Those who don't own land form part of the self help group, a group which generally stands to benefit from the income-generating employment activities in the watershed. There are 25,500 such groups now in the state. The role of women in the management of land, water, fodder and households is of prime importance. Therefore women's thrift and credit groups have been formed. Social banking of a kind is coming of age in mp. The state has 5,000 such groups where each member contributes Re 1 or more to the bank every day. Each group elects a secretary and the money is kept in her name to be disbursed to members as and when they require loans. the pebbles in the fields have become potatoes in the Hathipawa microshed of Jhabua district. In Phoolgaodi village, the villagers are celebrating the Year as the year of the Grass. In 40 ha of degraded government land, the watershed mission took up pasture development, where the production of more than 50,000 kg of grass is going to change the life of the villagers. The government has decided to give this land permanently to the village. In Kanadipura, a sumptuous meal of aloo - roti (potato and bread) is being prepared in many a household. With the regreening of the hills, the area has become prosperous once again. All this came cheap. According to Gopalakrishnan, the cost of treating one hectare of land came to Rs 3,000. One of the reasons being that not a single extra official was hired exclusively for this project. Raw material locally available was used for the minor construction work carried out in the area.A B Gupta, the district forest officer, pegs the cost at around Rs 2,500 per ha in Jhabua, while the Dhar district rural development authority (drda) chief claims it to be around Rs 1,800 per ha. One reason for this is that more people are coming in to offer voluntary labour as the benefits of the project are publicised. Ecological changes in the area are also showing up. 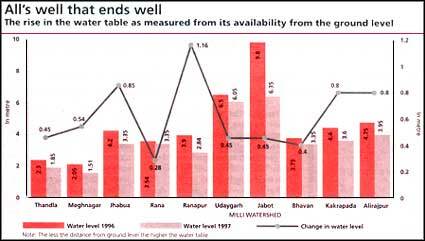 The groundwater table has begun to rise (see graph: All's well that ends well). The conservation of soil and water has also changed the crop patterns. In the valley area of the hills, farmers have now started cultivating two crops, including paddy, which requires a lot of water. The very hills - the angry giants - which contributed to Jhabua's ruin are the reasons for the success of the watershed mission. Nearly 30 per cent of Jhabua's terrain has a gradient and its terrain is the kind that will respond to watershed treatment. 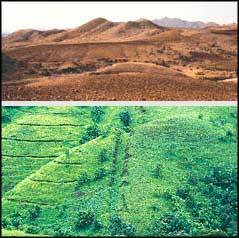 The regreening of the hills helped in retarding surface runoff and led to the absorption of water by the ground. But behind all this is the formidable political will of chief minister Digvijay Singh, bludgeoning the hills into submission and the bureaucracy into meek acquiescence. The other reasons are social. Since 86 per cent of the population is tribal - without distinctions of caste and creed and living under the same economic conditions - the process of convincing the locals about the mission was easy. The equilibrium between nature and people had already been lost and since the rate of migration was unduly high it made the residents highly adaptable to new situations, by exposing them to the world outside their villages. "This was the only dividend of large migration. It not only helped people in adopting a new concept but also helped the villagers in dealing with officials," says Rajesh Rajouria, drda chief, Jhabua. Since there was already a joint forestry management programme in existence before the introduction of the mission it also helped as the mission did not have to create a people based superstructure when it began. It was possible for the forest department to smoothly involve the people in the project through village forest councils which had already been set up. The ghost of Sukhomajri in Haryana, however, haunts Jhabua. Will the success of Jhabua run out of steam and face a failure similar to that of Sukhomajri is the question in the minds of planners and environmentalists. Sukhomajri was a dream come true for the forest department and the people in Haryana. Then it soured. Before Sukhomajri the Haryana forest department used to work on public and forest lands. But the work produced further conflicts between local people and foresters. The forest department was obviously not catering to the needs of fuel and fodder, which was alienating the people from the process. Then came the Sukhomajri experiment, clearly demonstrating to the Haryana forest department that with the involvement of the community the results were long lasting. But no real effort was made to hand over the management of resources to the people. The result was a series of unending conflicts. At the same time it is necessary to understand the needs of the different classes of people working in the village. Whether they are big, small or marginal farmers. Locally available technology also has to be assessed. The experiment failed in the Mittemari project in Karnataka as a uniform technology package was adopted for all the farmers. Worse, the participation of the people was incidental. No provisions were made for the transfer of the project to the locals once the officials left. So when the government exited, the project collapsed like a house of card. The ghost of past failures haunts the success story of Jhabua. As fodder has been given prime importance in the project, it is feared that once the forest regenerates, it may lead to a reduction in the quantity of grass available for cattle in the area, leading to a conflict between the largely pastoral population and the forest. But officials and experts feel differently. People will switch to better livestock and smaller cattle holdings, preferring it to large low-yielding stock, due to the availability of fodder. This will then bring down the demand for fodder, feels P K Mishra, executive director for the Society for Promotion of Wasteland Development (spwd), New Delhi. "For the tribals, the economy is based upon the ecology of the region," says Mishra, adding that this is due to their dependence on the forest. "Definitely the availability of grass will decrease. But the forest will regenerate and sustain the people." But when the four-year mission is over, and the link between the government and the people, an essential prerequisite to implementing the project, diminishes, will the people be able to manage and will it be possible for them to continue interacting with the government? In some of the watersheds where the mission is in the process of winding up people still run to officials for the sanctioning of funds and to check out the technicalities involved. 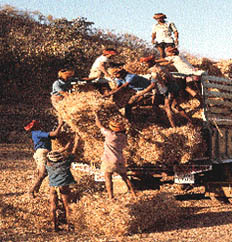 It is a natural outcome as villagers are members of different groups and have to manage all the activities. For instance, 17 books of accounts are required to be maintained in a single watershed by a community that is largely illiterate. However, Gopalakrishnan is upbeat. He has faith in the institution of the watershed committee and the women's thrift and credit organisations which, he feels, have proved themselves to be the power centre of the people at the lowest level. Once the people realise the benefits of the project it is very difficult to see it failing, he believes. There has been a decrease in the migration rate which is now pegged at 33 per cent and land productivity has gone up. Officials feel these are indications of the project's sustainability. There is another danger. The danger of conflicts arising over the use of peoples' money. The chances of this increase when funds are managed without any legal sanction or formal modalities. However, Mishra seems to concur with Gopalakrishnan. "These grassroots organisations have been constructed as the pillars of the watershed activities. When the government was planning for a national programme on watersheds, institution-building was given priority. In mp, these institutions have proved to be effective so they will not create conflicts," says Mishra. The grassroots organisations under the mission have certain credibility among the villagers as they are non-political. However, as they evolve and become stronger, the panchayat institutions will certainly be facing parallel power centres. To avoid this, district authorities have seen to it that most gram panchayat members become secretaries of the watershed committees. But it is possible that subsequent political interference may result in turning the watershed committees into bodies more political than they are supposed to be. Moreover the chances of conflicts over land are very high as the gram panchayat owns the common land and the committee owns the watershed and the area where the activities are carried out. In the three years of the mission's work such problems have been noted. The status report of the mission observes that it is much better if the demands of the different groups are placed together and each group gets a feel of the other's demand. This brings out the latent conflicts between the demands. It also highlights the impossibility of meeting the demands of all groups from available resources. Different views of groups and members of groups are reconciled to find out impartial solutions. Efforts to resolve conflicts ensure that the benefits are shared equitably and the assets are maintained jointly by the community itself. But Mishra is certain that Jhabua is a model that can be emulated nationwide due to its people participatory nature.